What is a Multi-Tiered System of Support (MTSS)? California’s MTSS focuses on aligning initiatives and resources within an educational organization to address the needs of all students. It is an integrated, comprehensive framework for local educational agencies (LEA) that aligns academic, behavioral, and social-emotional learning in a fully integrated system of support for the benefit of all students. MTSS offers the potential to create systematic change through intentional integration of services and supports to quickly identify and meet the needs of all students. California’s vast and complex Prekindergarten through grade twelve (Prek–12) educational system requires a multifaceted approach that is scalable and sustainable. The California Department of Education’s (CDE) vision of “one coherent system of education” offers an opportunity to build the foundation for educational excellence. Through the use of Implementation Science, Universal Design for Learning, and the Whole Child approach, among other evidence-based interventions, MTSS affords a full range of academic, behavioral, and social support for all students to achieve. View a quick primer video on MTSS (Video; 3:27), created by the Orange County Department of Education (OCDE), for an overview of MTSS. MTSS, Response to Instruction and Intervention (RtI²), and Positive Behavioral Interventions and Supports (PBIS) are often spoken of synonymously, and for those new to MTSS, it can be difficult to determine what people mean when these terms are used interchangeably. It is important to keep in mind, though, that MTSS is a framework for aligning resources and initiatives; it is a method of organization. As such, MTSS encompasses both RtI² and PBIS, and systematically addresses support for all students. 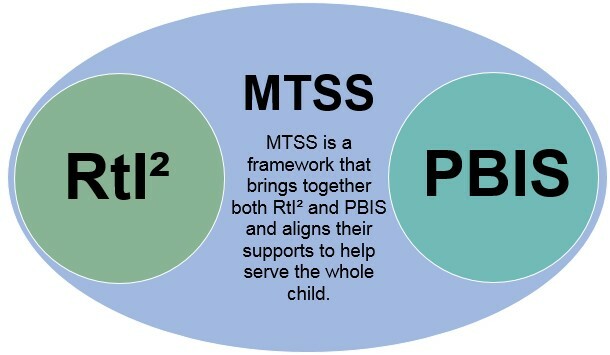 Since MTSS is a framework that brings together both RtI² and PBIS and aligns their supports to serve the whole child, it also relies on data gathering through universal screening, data-driven decision making, and problem solving teams, and focuses on content standards. MTSS aligns the entire system of initiatives, supports, and resources, and implements continuous improvement processes throughout the system. RtI² is an approach that focuses on individual students who are struggling academically and pulls together resources from the LEA, school, and community to promote students’ success before they fall behind. It is systematic and data-driven with tiered levels of intervention to benefit every student. PBIS is an approach that focuses on the emotional and behavioral learning of students, which leads to an increase in engagement and a decrease in problematic behavior over time. It assists the LEA in adopting and organizing evidence-based behavioral interventions that improve social and emotional behavior outcomes for all students. 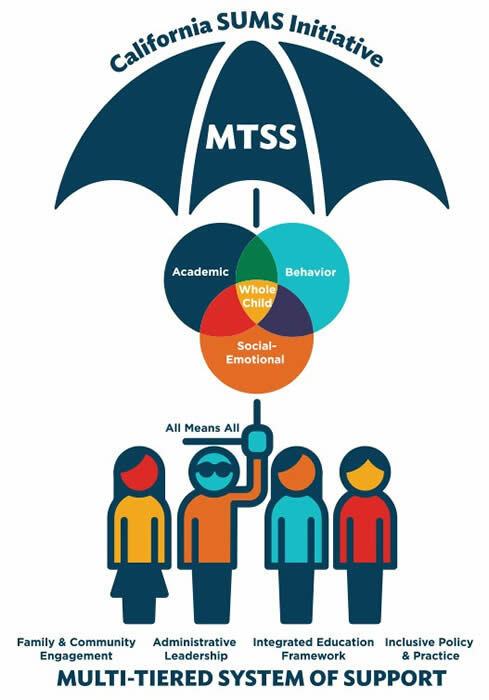 So, while RtI² focuses on academics and PBIS focuses on social and emotional learning, MTSS encompasses them all. It acts as a way of organizing supports within an LEA so that both the academic side and the social-emotional-learning side are aligned to serve the whole child. The focus of the Scaling Up MTSS Statewide (SUMS) Initiative is to develop resources for MTSS within an LEA that align the academic, behavioral, and social-emotional supports in an LEA in order to serve the whole child. It involves family and community engagement, administrative leadership, integrated education frameworks, and inclusive policy and practice. In 2015, Assembly Bill 104, Chapter 13, Statutes of 2015, appropriated $10,000,000 for Developing, Aligning, and Improving Systems of Academic and Behavioral Supports (ISABS). The CDE conducted a competitive grant process and awarded the funds to the OCDE for their SUMS proposal. In 2016, an additional $20,000,000, appropriated by Senate Bill 828, Chapter 29, Statutes 2016, augmented the original grant award. The Budget Act of 2018 authorized an additional $15,000,000, appropriated by AB 1808, Chapter 32, Statues of 2018 and SB 840, Chapter 29, Statutes of 2018. This phase of the grant focuses on improving school climate statewide. The purpose of the full $45,000,000 is to encourage LEAs to establish and align schoolwide, data-driven systems of academic and behavioral supports to more effectively meet the needs of California’s diverse learners in the most inclusive environment. The SUMS initiative enables the OCDE to develop and disseminate statewide resources and technical assistance for this purpose. For the first two funding phases of the SUMS grant, the OCDE subcontracted with the Schoolwide Integrated Framework for Transformation (SWIFT) Technical Assistance Center at the University of Kansas and the Butte County Office of Education (Butte COE) to partner with the SUMS effort. The Butte COE shares SUMS professional learning resources through My Digital Chalkboard, and engages rural areas of the state to support their unique needs. SWIFT is a technical assistance center that builds school capacity to support all students both academically and behaviorally. The SWIFT staff supports the SUMS grant by providing technical assistance and professional learning opportunities to participating LEAs. The OCDE has provided subgrants to LEAs to engage them in a process to assess their strengths, coordinate supports to their Local Control and Accountability Plans (LCAP) and align their MTSS efforts with the eight state priorities. The OCDE has distributed the grant funding into three separate cohorts with up to $6,000,000 awarded in each round of applications. For the third and most recent funding phase of the SUMS grant, the OCDE and the BCOE will partner with the University of California, Los Angeles (UCLA) Center for the Transformation of Schools to expand the state's MTSS framework. Through this collaborative effort, they will develop evidence-based tools and training for educators and school systems. Their work will expand restorative justice, bullying prevention and positive behavior interventions and minimize the use of emergency interventions. Their joint effort will also establish a pilot program to help LEAs to promote positive school climates by improving student-teacher relationships, increasing student engagement, and promoting alternative discipline practices. Visit the OCDE’s MTSS SUMS web page and the My Digital Chalkboard MTSS web page for more information about SUMS. This CDE document provides answers to questions regarding the 2015-16 Request for Applications. This news release describes the OCDE’s initial plans for the SUMS grant. This news release announces new SUMS grant funding and the OCDE’s partnership with UCLA to work on improving school climate statewide. For additional information on the SUMS grant, contact Jennifer Moreno by phone at 916-323-5505 or by e-mail at jmoreno@cde.ca.gov. The OCDE also has a Questions and Inquiries web page . The OCDE has developed an online training series to help LEAs in building an MTSS framework. The training series can be found on the OCDE’s web page . These national and state web resources were selected on the basis of usefulness to beginning as well as advanced MTSS implementers in kindergarten through grade twelve contexts. An instructional handout that includes the Domains and Features of an MTSS Framework. This guide provides an overview of MTSS in California (PDF). This brief provides information about universal, supplemental, and intensified support within an MTSS framework. Information regarding the annual MTSS PLI. The California MTSS framework uses a whole system of engagement to effectively link school, district, county, regional, state, and federal resources in efficient and innovative ways. These articles and policy briefs focus on MTSS and include examples of other state efforts. A brief by Orla Higgins Averill and Claudia Rinaldi on MTSS. The Kansas Multi-Tier System of Support. An overview of Florida’s MTSS implementation. A Council of the Great City Schools White Paper. An article in District Administration magazine.